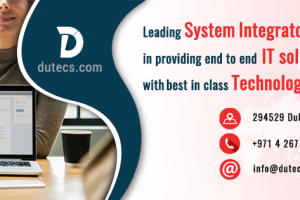 Dutecs is the outcome of the initiative shown by a group of like-minded experienced professionals to come up with out of the box solutions. Through Dutecs, we wanted to help businesses leverage IT and thereby increase customer value and gain a competitive advantage. With this aim we decided to venture into infrastructure, cloud, enterprise ICT, cyber security, BPO, AMC, and so on, which are the major areas where businesses need support and assistance. Our aim is to support IT departments in enhancing business value through cost effective global solutions that are robust, secure, and flexible. Today we are proud to say that we have helped our clients to transform their IT infrastructure to a dynamic one that conforms to the clients’ business needs and thereby yield best results. Dutecs is the outcome of the initiative shown by a group of like-minded experienced professionals to come up with out of the box solutions. Through Dutecs, we wanted to help businesses leverage IT and thereby increase customer value and gain a competitive advantage. With this aim we decided to venture into infrastructure, cloud, enterprise ICT, cyber security, BPO, AMC, and so on, which are the major areas where businesses need support and assistance.